Lloyd Thaxton: THE OLDER YOU ARE, THE LESS INTERESTING YOU ARE ? "SUTHERLAND'S RELEASE FROM JAIL NETS A YAWN"
That was the headline in a Los Angeles Times news story written by Andrew Blankstein. Kiefer Sutherland, according to the article, "walked out of jail early Monday, January 21st, "mostly to a collective shrug of tabloid indifference." Frank Griffin, co-owner of Bauer-Griffin photo agency and a veteran paparazzo, was more blunt, "He's not one of those faces that does much," Griffin said of Sutherland (the 41 year old actor). He's no Lindsay Lohan." I would guess you could substitute Lindsay Lohan in that statement with Britney Spears or Paris Hilton or any one of the other young starlets who feed the appetite of "celebrity magazines and the ever-growing ranks of Hollywood-related gossip blogs and websites." 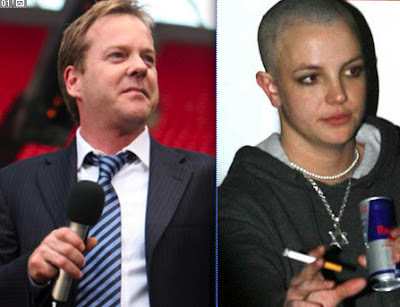 My immediate rebuttal to all this BS is: "Lindsay Lohan is no Kiefer Sutherland." Maybe that is because I am prejudiced. 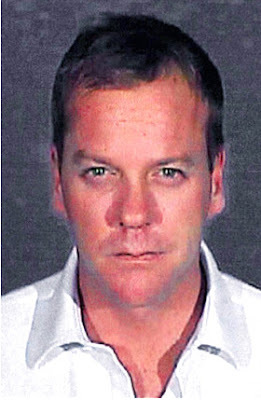 I don't think of Kiefer Sutherland as being Kiefer Sutherland. To me his name is Jack Bauer (note that the photo agency mentioned is "Bauer-Griffin." Jack Bauer would be a great paparazzo). My wife, Barbara's, and my favorite show on TV is "24." We don't watch it weekly. Couldn't stand to have to wait a week to see the next episode. We rent the DVD from Netflix and watch all 24 shows in about three days. A total submission into terror, torture and mayhem (and some damn good writing and directing). When I read that they considered Sutherland a "yawn," I went into CNN to see some pictures of his release. I couldn't find any. And, there was only one story on Kiefer Sutherland. However, there was a headline touting the fact that CNN had "ONE HUNDRED STORIES ON BRITNEY SPEARS." 100 to 1. It is my opinion that Kiefer's problem is that he thinks he is Kiefer Sutherland. He is not Kiefer Sutherland. HE IS JACK BAUER!! I went in to take a look at the headlines for the 100 Britney Spears stories. They were really dull. I'm going to list a few of the titles and then compare the headlines to what they would be if the same story was about Jack Bauer. I'm sure that you might have a few to add. "'UPBEAT' BRITNEY SPEARS HITS THE DANCE STUDIO"
"'UPBEAT' JACK BAUER HITS THE DANCE INSTRUCTOR"
"BRITNEY SPEARS LAPSES INTO A BRITISH ACCENT"
"JACK BAUER LAPSES INTO A COMA"
"PAPARAZZI CHASING JACK BAUER IS TORTURED"
Don't you see now how much more interesting Kiefer Sutherland would be if he would just drop the Kiefer bit and go all out for Jack? If so, there would never be headlines like this again. "SPEARS RELEASE FROM JAIL CAUSES A RIOT"
"SUTHERLANDS RELEASE FROM JAIL NETS A YAWN"
They say that "Youth controls the market." Take a look at this line up. Which one do you find more interesting. 41 year old Jack Bauer - or - any one of these young whipersnappers? I COMPLETELY AGREE. Who, with sense, really gives a f about Britney. Not that we need to know about Kiefer's daily trips to starbucks and the gas station... but I think it's stupid how Britney, LL, Paris, etc. get more publicity than real people who actually accomplish things in life. However, I'm sure Kiefer doesn't mind that his jail release isn't posted up on every website and blog, so good for him. It's just a bit messed up how colsely the American public watches these people's lives.